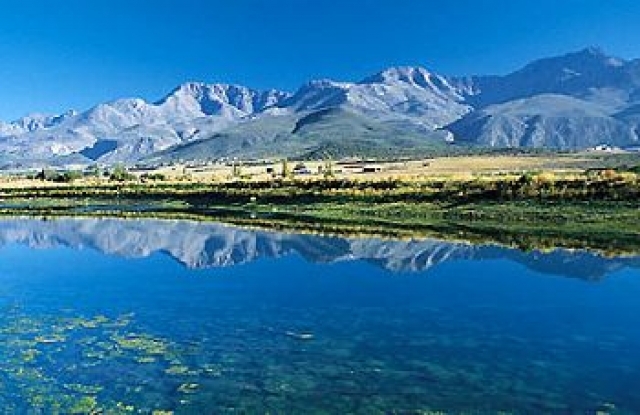 'The Jewel of the Klein Karoo' Ladismith is situated in the Klein Karoo at the foot of the Klein Swartberg mountain range. The majestic Towerkop, with it�s split peak, looms above the town. Ask even the youngest Ladismithian to draw a mountain, and nine times out of ten it will be Towerkop - the rare exception who draws something else must be the tenth child of a family newly settled in the town - because Towerberg is charged with all the magic its name suggests. Local legend has it that an angry witch, flying overhead, struck the peak with her wand, causing the split which today is seen from afar. No one needs to go any further to know that the peak changes marvelously, so that it looks bewitchingly different from every angle. Anyone who still doubt can climb it to fall under its spell. The town was established in 1852. Named after Lady Juana Smith, wife of the Governor of the Cape, Sir Harry Smith, the original 'Ladysmith' was changed in 1879 to 'Ladismith' to prevent confusion with a similarly named town in Kwazulu Natal. Ladismith serves as an extensive farming area with ideal climate for the production of quality fruit - apricots, peaches, plums, nectarines and grapes. As with the rest of the Little Karoo, Ladismith benefited from the ostrich feather boom at the turn of the century. Architectural Heritage A variety of architectural styles can still be seen in the old building of the town: from neo-Gothic to Victorian to the typical Ladismith style, square with round vents at the front. The town has a variety of churches, among which the exquisite Lutheran church and parsonage and the Dutch Reformed church designed by Otto Hager are the most prominent. The Otto Hager Church serves as the local Tourism Bureau. There are still many attractive houses dating from the Victorian era. Seweweekspoort / Seven Weeks Poort One of Ladismith�s most popular attractions is definitely Seweweekspoort / Seven Weeks Poort and is a definite must for hiking, moutainbiking and 4 x 4 enthusiasts! It is one of the most awe-inspiring and spectacular of all the mountain ravines in the country. Author and poet, CJ Langenhoven, called it one of the 'seven wonders' of the old Cape Province. Seweweekspoort was opened in 1862 and was one of the first links through the Swartberg range. It is a spectacular drive: towering cliffs, jagged rock formations, which was formed by the forces of volcanic eruptions, and interesting river crossings The pass winds for 17km through the mountains at a level of 600 - 1000m above sea level. It crosses the stream 23 times, whilst the mountain slopes on both sides reach 1500 - 2000m. A definite must for any tourist visiting Ladismith!